Besides the beautiful falls, there's a ton of delicious food. Niagra Falls is lit up at night as seen from Canada. 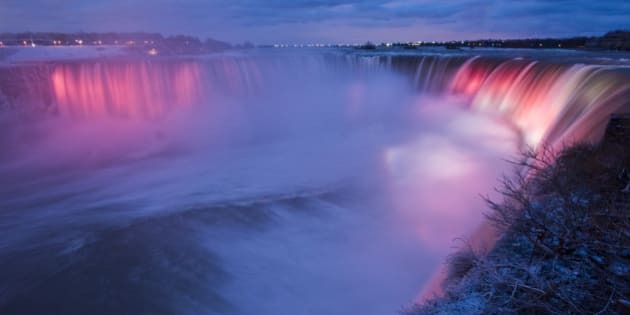 Niagara Falls might be known for one of the most beautiful natural sights in the world, but in recent years, it's come into its own in terms of other pleasures — and no, we're not talking about the casinos and, ahem, other attractions. The rich agricultural landscape surrounding Niagara Falls has lent itself to a serious restaurant boom, which is no surprise to anyone who has spent time at one of the approximately six dozen vineyards in the region, many of which have dining rooms of their own. The culinary scene in the area is so packed, it's even generating its own interest, something Kimberley Gunning, who runs Niagara Culinary Tours with her husband Steven Lovelace, is more than happy to oblige. The couple runs tours throughout the year, visiting at least four restaurants on each one and providing historical and cultural context for the area. "Our mission is always to find that next best place that has great food, a good vibe and totally delivers in service," she tells The Huffington Post Canada. "We drive by vineyards and orchards every day on our way to work, and we can't believe how lucky we are." Joanne Deall, a transplanted Torontonian who runs Highbrook Bed and Breakfast in Niagara-on-the-Lake with her partner, Ken, as well as Niagarafied, a lifestyle blog about her experiences in the area, points to the "local love" as the region's biggest strength. "People here are huge supporters of buying local foods, products, and supporting local restaurants," she tells The Huffington Post Canada. "Several are embracing the farm-to-table concept, and we also have a lot of great food trucks, like The Yellow Pear, that make some amazing food too." Gunning has seen an increasing number of pop-up meal options, whether they're in vineyards for a limited time, or weekly supper markets that join local food vendors with wine and craft beer makers to let them experiment with new ideas. "Seriously we have to pinch ourselves sometimes because it is a far cry from when we moved here and missed Toronto so much," she notes, having relocated to her hometown in 1993. "We just attended a pop up dinner recently and had an absolutely mind-blowing experience. Imagine a rutabaga baked in mud on a fire!" Check out these Niagara experts' picks on the best places to eat in the region — and don't forget to add your own!